Judge Greg Pinski presides over the Veterans Court’s inaugural graduation ceremony. David Belcher (right) was the court's first graduate and has now joined his mentor Joe Parsetich (left) in the program’s mentor ranks. Dave Belcher served in the Army for 17 years. He was a platoon sergeant and received a Bronze Star and a Combat Infantry Badge, but he came home with a brain injury and post-traumatic stress disorder (PTSD). Belcher’s life hit bottom when he awoke from a nightmare and attacked his girlfriend, who ended up in the hospital. He pleaded guilty to the attack and faced at least nine years in prison. That was when he learned about the Cascade County Veterans Court in Great Falls, Mont. State District Judge Greg Pinski, a member of Redeemer Lutheran Church in Great Falls, started the court program in November 2013 when he was searching for a need he could address. “When you look at the number of Iraq and Afghanistan vets coming back with PTSD and traumatic brain injuries, their injuries and struggles get out of hand and, by the very nature of their issues, they seem to become involved in the justice system,” Pinski said. Since Great Falls has an Air Force base and a National Guard, Pinski thought it was a good fit for this specialized court. Pinski is not alone in his efforts or his convictions. Jennifer Quick, a member of First English Evangelical Lutheran Church, Great Falls, is a prosecutor in Cascade County who has also played a large role in the Veterans Court. She, too, connects her faith with her work in the program. In February, Quick was honored for her work with the program, receiving a certificate of appreciation from the U.S. Attorney’s Office for the District of Montana. In its first two years, Veterans Court has enrolled 24 participants with 11 graduating, 12 still involved and three more waiting to join. Although some choose Veterans Court over prison time as the easy way out, Pinski said the program is not easy. 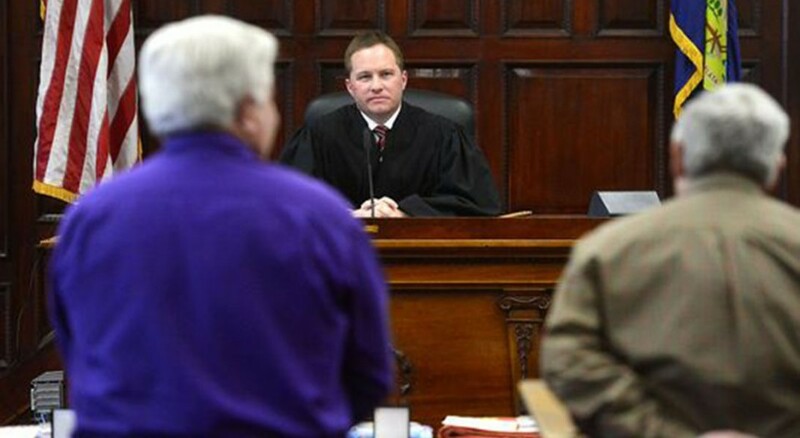 Participants must appear in court and meet with their probation officers every week. They are randomly drug tested at least two times a week and must go through continuous alcohol monitoring for the first 90 days. Additionally, multiple weekly substance abuse meetings and counseling sessions are scheduled for each individual. By all accounts, the system is working. Pinski said that on a national level, 70 percent of participants graduate and 75 percent of graduates are not reimprisoned. Quick said she’s heard from some veterans that their clarity of mind after addiction and mental health counseling has made family life and church a priority. The faith community becomes part of their sobriety and part of making a positive network in their lives. After 18 months in Veterans Court, Belcher was the program’s first graduate. Today he is clean and sober, volunteers as a mentor for the program and has been married for two years to Michelle, his girlfriend during his period of nightmares. Jenny Kunka is director of the Northern Rockies Institute of Theology, a lifelong learning ministry of the ELCA Montana Synod, and also works as a freelance writer.